Dear Friends, - CHARTER SCHOOL WATCHDOG http://www.charterschoolwatchdog. 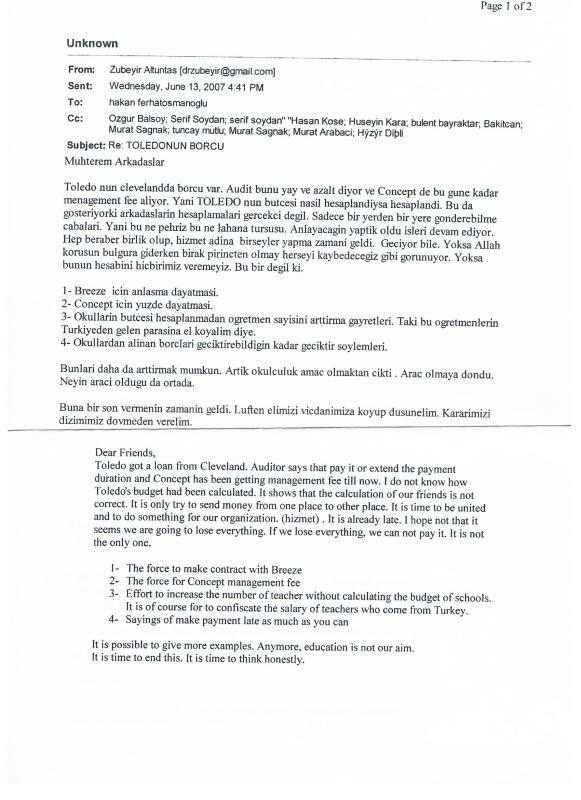 Zubeyir Altunas seems a bit disgruntled about some of the tenents of Hizmet (Gulen's cult rules), and in particular about the recruitment of Turkish teachers as a means to "confiscate" their salaries (see the Tuzuk blog for that explanation), and other nefarious activities that they boys are engaged in. But wait, how can that be? Altunas admits that "education is not our aim." Gosh, Zubeyir, at what point during the mass pillaging of American tax dollar pockets over the past 15 years did you figure that out? And this guy holds a Ph.d. and is a researcher -- guess he needs to refine his researching skills. And as for his reference to "honesty", maybe the word has a different meaning in Turkish, because here in the United States, the boys use the term "honesty" as antonym -- saying and doing everything in its most opposite state.